The power of the tool is the primary thing I look for before purchasing any saw. Although I have tried and reviewed many such table saws, I had yet to come across one that could effortlessly cut through any type of wood. Therefore, I was pleasantly surprised when I first tried out the Ridgid R4516. Such is the power of this saw that you will not have to think whether it will be useful for any specific project. Use it for any woodworking project and it succeeds with flying colors. I am writing this Ridgid R4516 Table Saw Review keeping in mind both professionals and amateurs. I was impressed by the capability of this device along with the fact that it boasts of an extremely compact design. This means that you can take it wherever you want without any hassle or facing issue. The wheeled base of this unit facilitates easy transportation. This feature saves you time and fatigue. Although the price of this unit is a bit on the higher side, I strongly recommend that you purchase this unit instead of going for any cheap table saw you find online. For this extra price you get a heavy duty and high quality tool that will provide you with excellent service for many years. Q: Does this unit ship with a rip fence? Q: Does it have a dust collection port? Q: Can I use a Dado blade? I was highly impressed with the heavy duty build of this machine and its capability to handle all types of wood with ease. Moving the unit from one workplace to the other is not a big deal as the unit contains wheels on its base. Unlike other saws, this motor of this unit hardly makes any noise. Apart from being versatile, this unit boasts of one of the best miter gauge that I have ever seen. The specs page says that this unit supports Dado stack, however, you will face problems while using an 8″ stack, but the unit handles the 6″ Dado stack efficiently. The rollers and the portable design of this unit ensure that I could easily take it from one location to the other sans problems. I consider myself lucky that I purchased this unit, despite its high cost, instead of a cheaper model. The power that this unit delivers more than compensates its extra price. The fence included with this unit is the best that I have seen on portable saws. Changing blades hardly takes any time and the unit contains all the safety features. I wish that the manufacturers provided a better push stick instead of the hard plastic one. Remember to register the machine online to avail of lifetime warranty. Do not take a chance with any other saw, if you are looking for a high quality and heavy duty tool that will effortlessly undertake all typed of woodworking jobs, and is portable, plus contains rollers in its base, allowing you to easily take it from one location to the other. Powered by 120 Volts at 15 amps, this unit has a dual locking rip fence, which clamps on both the rear and front of the table, facilitating accurate alignment. The convenient on board storage of the Ridgid R4516 holds power cord, push stick, and miter gauge, allowing you to transport the tool easily. The unit ships with accessories such as push stick, blade wrenches, miter gauge, rip fence, anti kickback paws, tool less blade guard, and one carbide tipped blade. A rugged steel tubing frame for durability and protection supports the cabinet. The durability of this saw can be gauged by the fact that it is able to withstand hits and drops, an extremely important feature if you do jobs on busy construction sites. The dust collection port of this work beast excels that of other units in its category. Do not expect total dust collection though, as the unit is not completely enclosed. I was very impressed by the precision and versatility of the R4516. Forget about the wobbly miter gauge found on most units as this model has a sturdy as well as accurate miter gauge. I loved the clean and comprehensive engraved numbers on the unit, which ensures that I need not worry about losing the desired angle in the middle of a project. The price of this unit is a bit on the higher side. However, I have no complaints, considering the array of features this unit has. In fact, it costs cheaper that many other models that have fewer features. This unit scores higher than comparable units on the safety front too. The anti kickback system is unarguably the most important safety features in a table saw. This unit provides top safety levels, as it boasts of an excellent anti kickback mechanism. I was impressed by the large on & off switch that this saw contains. Many people rarely bother abut the size of the feature, but forget that on occasions it can make a difference between life and death. Apart from being large, the reaction time of the switch is excellent. Proper maintenance is paramount in increasing the life of a saw. Maintaining this unit is extremely simple; you will find details of the same in the included user manual. The Ridgid R4516 ships with accessories such as blade wrenches, push stick, rip fence, miter gauge, a carbide tipped blade, tool less blade guard, and anti kickback paws. 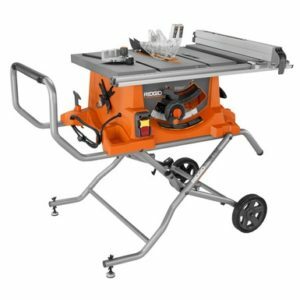 While do it yourself enthusiasts can use this table saw, they can be better off with lower priced units that meet their requirements. This unit is better suited for professionals, who require a heavy duty machine, that tackles all sorts of jobs, and allows the user to shift it from one work location to the other, as it is extremely compact and contains a roller wheel base. This is one of the rare occasions when I hardly have any complaints about a table saw. The manufacturers have done a fine job with this unit. However, they can push this unit to the top of the best seller list by improving the dust collection unit and change the insert so that it exact matches the width of the blade. This will prevent things from falling through the hole. Ridgid R4516 vs Bosch gts1031: The Bosch model is slightly heavier at 64.8 pounds compared to the 63 pounds of the Ridgid model. While the Bosch runs on 127 Volts at 15 amps, the Ridgid requires 120 Volts at 15 amperes. Both units have a no load rotation of 1500 RPM. While both makes are sturdy, the Ridgid forges ahead because of its wheeled base, which makes it easier to transport. Ridgid R4516 vs Dewalt 7491rs: Both models have the same operating voltage and amperage of 120 volts at 15 amps. Users have to set up the rolling stand of the Dewalt, while there is no such issue with the Ridgid. While the Ridgid has a single dust collection port, there are 2 on its Dewalt counterpart. The Dewalt offers a limited 3 years warranty, whereas Ridgid offers lifetime warranty once the user registers the unit online. Users are extremely satisfied with this saw, because of its portability and ability to tackle any type of job without complaining. Professionals who have to move from one workplace to the other adore the wheeled base of the unit that allows them to move it from one place to the other easily. The affordable price of the unit and the fact that it performs as advertised impresses them too. If you are looking for a budget range saw that handles all types of mid sized woodwork jobs, go for the Ridgid R4516. You can rest assured that you will never search for a different model again. The included retractable handle and 6 inch wheel base allows users to easily shift the device from one place to the other. You might find it difficult to find another heavy duty saw at the price range that is as robust and rugged as this unit is.